Melissa's Mochas, Mysteries and Meows: Happy 239th Birthday, America! Wow, you're lookin' good for your age! Let's celebrate the American spirit this weekend by supporting a small business owner! 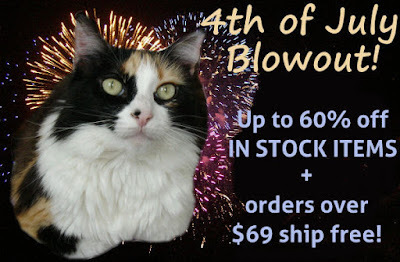 Our friend Baby Patches from the Nip and Bones store is having a 4th of July Blowout Sale with select items up to 60% off! 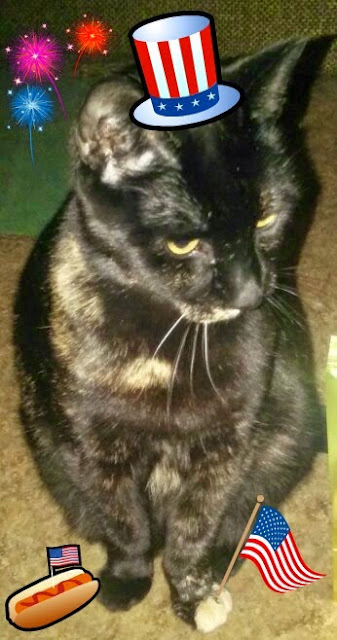 Her human has been struggling with some health issues, and as a result her online store is struggling. We certainly don't want Nip and Bones to have to close down, so a bunch of Baby Patches' kitty blogger friends are getting together to help spread the word. Don't tell Mommy, but I have plans for later tonight with her credit card and iPad! After all, I have a Gotcha Day coming up next month, so won't she be happy to see that I've taken advantage of a pawsome sale to do my shopping? While I'm at it I think I'll pick out some things to put away for Secret Paws gifts...Christmas is right around the corner! We're entering our July 4th image in Athena's Caturday Art blog hop. We ordered several items from Nip and Bones. Can't wait to get them. Happy Independence Day to you, too! Enjoy it, but stay safe. Happy 4th of July! You look ready to party, Truffles! Happy 4th of July and Happy Birthday Truffles! Happy Independence Day, Truffles! I like your idea of stealing the human's credit card. I have a birthday later this month and think I am entitled to a little shopping, too. Mommy took a little money from our PayPal account and bought a little kitty bowl for me from Nip and Bones,. We love helping others when we can! And I have a couple other things from Nip and Bones, so I know how lovely they are to their customers! You inspired me to buy a cat toy I've been looking at for ages (and it wasn't one of the sale items!). A small thing, but I hope the thought helps. You look bootyful Truffles. Have a pawsum day and stay safe. We luv da Nip and Bones. Can't afford them, but luv them. Weez sendin' purrayers. Oh, we are off to check out Nip and Bones! Happy Independence Day from a bunch of independent felines! We hope you're having a great 4th of July! We did our shopping at Nip and Bones cos BP has been my Twitter furrend for 6 sixs now. Hope the mystery boxes are still available for you. Happy 4th! We ordered from Nip and Bones! Happy 4th! Happy 4th of July to you...you are looking wonderfully festive...hope you are enjoying your holiday weekend! Your hat looks so cute! Hope you had a great 4th! You look so cute! We ordered and we're hoping to be able to participate in Secret Pawd this year.